Compare prices from multiple car hire suppliers in Vilamoura to find the best available deal. A few of the car rental companies we compare include Gold Car, Budget, Avis, Hertz, Sixt and many more. Vilamoura is a town located in the southern region of Algarve in Portugal. It is actually a purpose built marina and resort that was created from scratch by Cupertino de Miranda, a wealthy banker residing in Porto. Vilamoura is approximately 20 square kilometers and is one of the largest beach resorts throughout Europe. Because the entire town is privately owned, the design is quite decadent. It was the host of the Almond Blossom Cross Country from 1996 to 2003. 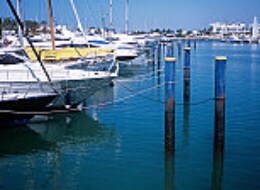 The marina lies at the heart of Vilamoura and can house more than 1,000 boats. It is surrounded by holiday homes, three to five star hotels, restaurants, bars, and even a bit casino. Many people charter boats to do some big game fishing as well as parascending and jet skiing. Individuals can also take tours of caves located along the coastline. There is also a museum that provides insight to the past of the area and Roman ruins, including bath houses. The town of Vilamoura is located 14.84 kilometers from the Faro Airport (FAO).